Day four is coming, I promise. There is an image I need to track down to add to the post before it goes live. I had to laugh as the trains were running late when I got to the platform. There were maintenance issues delaying the trains on platform one. 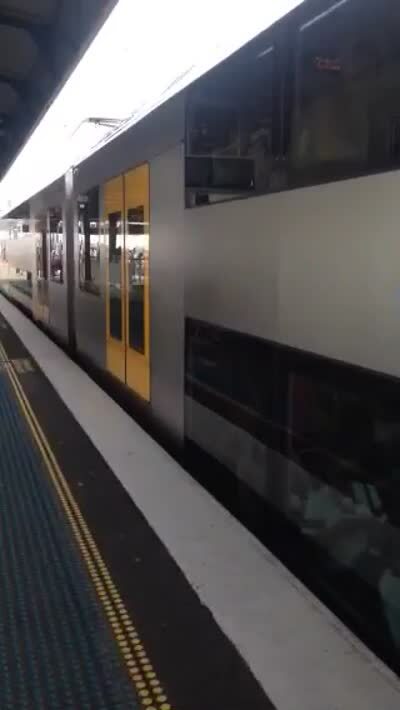 About eight trains went by on platform tw0 to a place called Hornsby. Apparently it got better service this morning than downtown. I guess it doesn’t matter which part of the world your in, mass transit sometimes runs late. I’m reminded of humidity. Sydney is not quite as humid as Atlanta, but considerably more so than San Francisco. Signage for the preferred seats on the bus… none of the icons are very flattering! Today was my first real day in the office. It was great to see all of my colleagues from Sydney again. It’s always good to see things from a different perspective. Afternoon meeting in San Francisco become early morning meetings in Sydney. People with him you used to seeing through videoconference are now live in person. Those with whom you used to work are now behind the glass of a video conference system. One of my goals in the early part of this trip was to find a bicycle that I can use to extend my reach into Sydney. The trains are great but only afford a fairly narrow coverage area. The buses here are considerably more complex but God bless Google maps for making it easier to navigate. Sometimes though, it’s nice to just be on your own and wander. I found a nice cruiser bike on GumTree, the Australian version of Craigslist. She was out in Balmain, two bus rides away from downtown. The bus system here has a zone System so the more you ride the more the tickets cost. I’m familiar with that system with respect to trains back home, but I had no idea what ticket I needed to get to where I was going. I just hoped the one I had would work. To make matters more interesting, it started raining right as I left the office. I found the bus stop after about 10 minutes looking for the pick up. Traffic downtown was in gridlock due to the rain. I couldn’t get across the street to make the transfer so I wandered around to find another bus stop on my side of the street. The first bus that I can take blew by me as I come to find out you’re supposed to wave rather than to stand out on the sidewalk for them to pick you up. The lady bought the bike from selling it as she was returning back to school for her masters and wasn’t riding it. It’s a bit different of a bike then I normally ride. It is a hybrid cruiser that’s more mellow than the high strung road bike I have back home. I didn’t want to spend a lot on a bike as it will live a somewhat rough life here getting on the train and getting locked up to posts here in town. The ferry was the easiest option back home. The rain continued into the evening and made for an interesting ride. It was also the first time being on the left side of the road in a long time for this American. A damp but warm evening here in Sydneyattle. In California wet always comes with cold. It’s kind of nice to hear sqish, sqish, sqish in your feet and not be shivering down to your bones. Glad u like it even in the rain!! Love the bike – reminds me of the one ray got me years ago- u have it a test run and it broke and landed you all over the road!! Beautiful pics!! !